The final elighthouse public seminar took place on Wednesday 27th March 2019 in Finnkino Plaza, Oulu, Finland, and aimed to inform the general public about the elighthouse project progress and steps that the project has taken to develop energy efficient communities in each of the partner regions, located in the Northern Periphery. A large audience attended the event, and included both public members from Oulu, Finland, and the wider region, as well as attendees from Ireland, Greenland, Sweden and Norway. Anu Montin, from Oulu University of Applied Sciences, opened the seminar and thanked the members of the public for attending the event, as well as for their ongoing support of the project. This was followed by a short welcome from Kyosti Oikarinen, Chairman of the Oulu City Board, who alluded to several strategies that are currently in place in Oulu to reduce energy use and increase efficiency, including a focus on extensive investment in public transport. Following this short introduction, elighthouse project lead partner Antti Haapalahti, Oulu University of Applied Sciences, and Heidi Taurianen, City of Oulu, provided an overview of the elighthouse project, its key aims and objectives, and outlined the positive networking experiences enabled by the project. In particular, Antti Haapalahti alluded to the great strides being made in the energy efficiency sectors in each of the partner regions, and attributed this success to the opportunities, as well as the knowledge transfer, facilitated by the elighthouse project. Antti Haapalahti and Heidi Taurianen also discussed some of the primary project achievements, affirming that the project was set to overachieve on all initial project indicators. Subsequently, three project partners presented some of the key findings of the elighthouse project from their partner region. First, Ciarán Galvin, Cork County Council, discussed energy efficiency in public buildings in Cork, Ireland, and contended that public buildings retrofitted through the elighthouse project in Cork have achieved an 18% energy improvement. This was followed by a presentation from Jose Ospina, NCE Insulation, on the retrofitting actions currently being undertaken by the community based agency in Cork, as well as the specific work of the organisation during the elighthouse project. Finally, Erik Eklund, Umea Kommun, and Gireesh Nair, Umea University, discussed the key actions undertaken in Umea, Sweden, where municipal buildings have achieved 4.2% energy saving through actions undertaken during the project. The second session of the final elighthouse public seminar involved three presentations from external speakers concerning the overall elighthouse topic of energy efficiency and developing energy efficient communities. Harri Heinaro from Motiva outlined the role energy efficient buildings in meeting sustainable development goals in Finland, while Terttu Vainio from VTT Tampere discussed the results of another European project, EU-GUGLE. EU-GUGLE involves eight pilot cities aiming to renovate 226,000m2 of living space with the objective of achieving 40-80% primary energy savings and increasing the share of renewable energy sources by 25%. Finally, Klaus Känsälä VTT Oulu delivered the final presentation of the final elighthouse public seminar, discussing the H2020 Making-City project which involves developing PEDs (Positive Energy Districts). Following the three session presentations Anu Montin, Oulu University of Applied Sciences, closed the seminar and thanked the attendees for their contributions and presence. 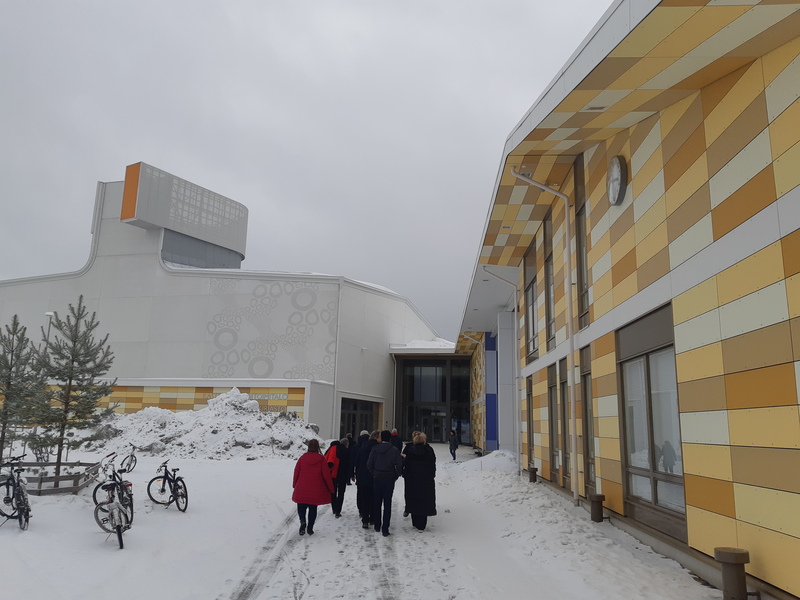 Following the conclusion of the seminar, several site visits to retrofitted energy efficient public buildings took place in the afternoon for interested attendees, including; Laanila’s School; Raksila Swimming Pool, and; Looki Kitchen.